I’ve been taking little bites of domain analysis of KO, working my way through conference proceedings, and as CFPs allow, taking other bites as well (the legacy of Two kinds of power was one, and north American pioneers was another). This year I presented what was supposed to be a meta-analysis at CAIS. Unfortunately, CAIS has got this new procedure whereby you don’t really write a paper, so, there’s no paper, sorry. Just an extended abstract. “Domain Coherence within Knowledge Organization: People, Interacting Theoretically, Across Geopolitical and Cultural Boundaries.” In McKenzie, Pam, Catherine Johnson and Sarah Stevenson eds., Exploring Interactions of People, Places and Information, Proceedings of the 39th Annual CAIS/ACSI Conference, University of New Brunswick, Fredericton, N.B. Canada, June 2-4, 2011. http://www.cais-acsi.ca/conferences.htm. 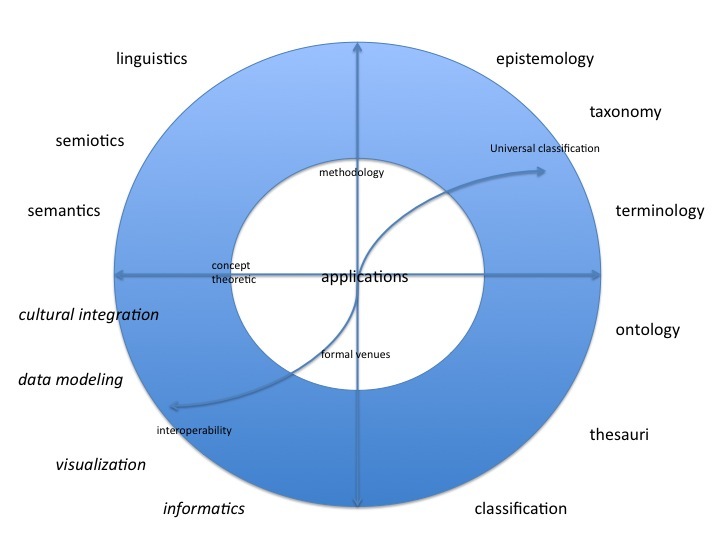 Domain analysis is the study of the evolution of discourse within research communities. Domain analytical studies of knowledge organization are here drawn together for meta-analysis to demonstrate coherence of theoretical poles within the domain. Despite geopolitical and cultural diversity, the domain shows theoretical coherence. Here’s a colorful visualization of the intension and extension of the domain. It shows us coherence within the domain, despite geographical distinctions. There also a shift from emphasis on universal bibliographic classifications to increasing granularity as the Internet imposes new challenges, from 1993 onward.